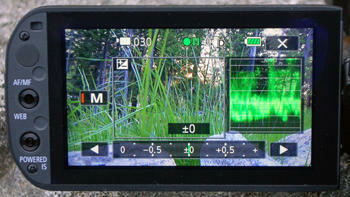 I had a sneaking suspicion the Canon Vixia HF G10 would reign supreme the millisecond I saw it at CES earlier this year. But first, let's flash back to the beginning of 2010, where the consumer camcorder world saw Panasonic's HDC-HS700 battle Canon's Vixia HF S21, a fight to the death. In the end, I opted for the Panasonic, thanks to its intergalactic 60p video quality. The Vixia HF S21 was built like a brick house, all mighty mighty, letting it all hang out, but the Panny's manual controls and overall image quality bopped the Vixia HF S21 down to second place. The year 2011 is an entirely different game of hockey, however. Canon's game-winning slapshot is called the Vixia HF G10, and it will go on to win the camcorder Stanley Cup this year, hands down. Even Panasonic's new HDC-HS900 could not put up the defense necessary to prevent the Vixia HF G10 from busting into the crease and dekeing its way past the goalie. A new bar has been raised within the consumer camcorder market, and it's called the Canon Vixia HF G10. Perhaps it was the beast's giant focus ring, 8-bladed iris, ample manual controls, or improved built-in microphone. Those high-end features were certainly welcomed, but in the end, it was the Canon Vixia HF G10's supersonic image quality and exceptional low light sensitivity (courtesy of its brand new HD CMOS Pro sensor) that made it the optimal choice for the budget filmmaker or high-end enthusiast. Personally, I have not seen a better HD camcorder in the consumer circuit, and Canon will not be getting the HF G10 back from me for quite some time. At $1500 smackers, the HF G10 is a bit of an investment, but it's one your might want to make after reading our review. Like last year's Canon Vixia HF S21, the HF G10 flaunts a top-notch build. The Panasonic HDC-HS900 is more like a pimped out Geo Metro compared to the Rolls Royce Canon Vixia HF G10. We'll begin with the obvious changes, kicking it off with the HF G10's obscene lens focus ring that shifted smoother than a slathering of Country Crock in the middle of July. Although the Focus ring's only task was to alter the focal length of the beautiful Canon HD video lens, Canon gave us a custom dial along the backside of the camcorder that controlled shutter/aperture, manual exposure, gain or exposure compensation. This way, we were able to customize the dial with one of our most-used controls from that list and use the focus ring simultaneously. Canon also spruced up the zoom rocker, widening it and refining its smoothness. I would have liked the ability to switch between zoom and focus control using the lens ring, but the rocker was efficient enough, especially with its 16 different fixed speeds. If we're lucky, we'll get two rings next year for that purpose, and I'll have 14 litters of kittens out of sheer excitement. The dual SD/SDHC/SDXC card slots were carried over from last year, enabling us to throw in cards with up to 64GB capacities and continuously record via Canon's relay technology. Inside, the HF G10 has 32GB of Flash memory, which is on the light side compared to the Panasonic HDC-HS900's 220GB HDD. The Vixia HF G10's battery resided on the small side and did not provide an adequate life, so backup packs are a must buy. On the monitor end of the spectrum, the Canon Vixia HF G10 has a 3.5-inch touchscreen display with a 922,000-pixel resolution. At times, I was cursing up a storm trying to make selections on the screen, so don't expect iPhone sensitivity here. The camcorder also rocks an extendable 0.24-inch 260,000-pixel color viewfinder for those blazing days, and the LCD panel features two customizable button controls that default to AF/MF and Powered IS. For connectivity, the Canon Vixia HF G10 offered a component, AV Out/headphone, remote, HDMI Out, USB and a mic jack, which is what we got on the Vixia HF S21. On top was Canon's proprietary hot shoe, along with a set of stereo microphones. 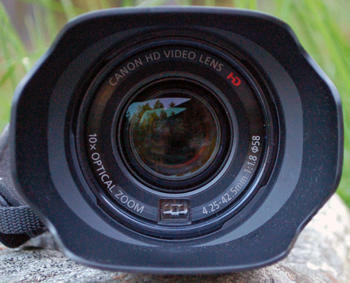 The Canon Vixia HF G10 bridges the prosumer gap with its advanced design. This section is always an endless playground for me, and the Canon Vixia HF G10 cranked out plenty of monkey bars when it came to manual controls. We'll start with manual exposure, which not only gave us 70% or 100% Zebra patterns for blown highlights, but the HF G10 featured a waveform monitor that was more advanced than anything I've seen on a consumer camcorder, rivaling Navy SEAL technology. We could also adjust the gain up to 24dB, which surpassed the old 18dB standard offered by Panasonic. The focus assist magnification was also actually useful, thanks to an improved resolution while magnified, and we even got color peaking as a focus assist alternative. But the waveform monitor also showed up in the Manual Focus arena, allowing us to use peaking and Focus Assist in conjunction with it. Never have I seen such an advanced set of manual controls on a consumer camcorder—Panasonic should be crying right about now. There was also a digital Level Meter for leveling shots, SMPTE standard color bars and test tones, 2,000K to 15000K range White Balance adjustment, and a slew of in-camera filters like Vivid, Dream, Nostalgia, and Old Movies. Although I could add filters in Premiere Pro, it was nice to have the option for those who are devoid of a quality NLE program. Like the Canon Vixia HF S21, the Canon Vixia HF G10 was equipped with four different frame rates. There's native 24p, meaning the camcorder captures every single frame without the process of interlacing. Of course the Vixia HF G10 had 60i and a simulated 24p and 30p recorded at 60i, but I found that the best results resided within native 24p shooting. Simulated progressive frame rates are only useful for down-converting to standard definition or working with other simulated framerates on a 60i timeline. 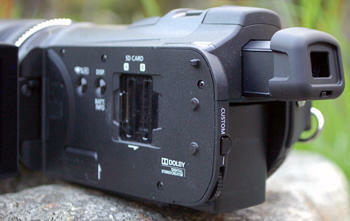 Regardless, if you want your work to have an unmistakably film-like look, then the Canon Vixia HF G10 is the answer. Image stabilization on the HF G10 was great, especially when pressing and holding the Powered IS button to minimize shake even more. I also loved the versatility of the new microphone, which had four settings that included monaural, normal, wide and zoom. I could also adjust the frequency response with low and mid-range levels. However, my Rode Videomic was superior to the built-in mic, and any serious shooter will want to use an aftermarket boom or directional. This is where the Canon Vixia HF G10 brought home the bacon. 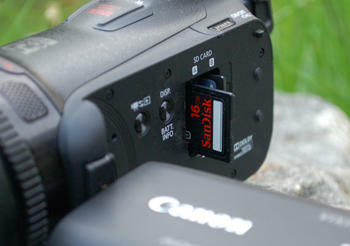 The camcorder has Canon's new single 1/3-inch HD CMOS Pro chip with 2.07 effective megapixels. Video can be captured at an impressive 24Mbps in the highest quality (MXP) via the AVCHD format. For glass, the Vixia HF G10 has a 10x optical zoom Canon HD video lens with an 8-bladed iris that allowed us to capture smooth bokeh effects. The lens had an f/1.8 aperture for 20mm macro shooting, and its overall quality trumped many camcorders in its class. Canon is always known for its quality glass. So, those are a bunch of fancy-sounding specs and all, but how did the Canon Vixia HF G10 perform? In our tests, color, detail and resolution were off the charts for a consumer camcorder. Noise levels were also lower than I had ever seen, especially in low light. The HF G10 flaunts a minimum illumination of 1.5 lux with auto slow shutter on at 1/30 shutter speed, and 0.1 lux in the low light scene mode. I kept searching for rabid blue noise, but came up empty in most of my tests with the lights down. Shooting in 24p mode yielded the most optimal results, thanks to the lower shutter speed, which inevitably lured more light through the lens and whittled noise down significantly. 60i looked fantastic for motion, thanks to the heightened framerate, though low light sensitivity took a minor dive for that same reason. 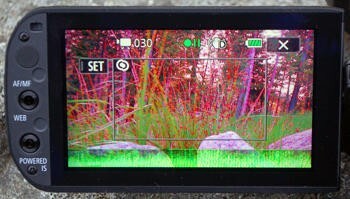 Keep in mind that in extremely low lighting conditions, the Vixia HF G10 exhibited a moderate amount of noise, but it was the camcorder's overall sensitivity that trumped its competitors. The bottom line with the Canon Vixia HF G10 is that if you're looking for a camcorder to shoot short films or commercials with, you can finally do it in the consumer market and feel confident about it. The Vixia HF G10 is an imaging powerhouse that rivals prosumer models when it comes to image quality. This review has already engulfed an avalanche of your time, but the conclusion is short and sweet. The Canon Vixia HF G10 is currently the greatest consumer HD camcorder ever produced. Its topnotch build, prosumer-esque manual controls, and stellar image quality put it numerous car lengths ahead of the competition. Although I'd like to see a larger battery pack and a zoom ring on the next version of the HF G10, Panasonic is still going to have to head back to the drawing board if they want to tango with Canon's follow-up next year at CES. Last year, Panasonic had won me over with the HDC-HS700, but this is Canon's year, and it's going to require one hell of a machine to take the HF G10 down to Chinatown.